I was born in South Africa just over 30 years ago -- and because I happened to be born with white skin, I got a big head-start in life. Enough to eat, a good school, and I went on to university. But I could just as easily have been born black, or poor, or in a country like Syria or Sudan -- my life would’ve been fundamentally different. Today we're facing the largest refugee crisis since World War 2 -- for some, their situation is so bad that they sell their whole life for a tiny rubber boat to get them across the sea. That’s not a choice: it’s the lack of one. And in another time or place it could so easily be you or me floating on the waves. We see the photos of babies in blankets, held over dad’s head as he wades into the water. The wooden boat for ten carrying 50. The little girl who packed her whole life and all her school photos into a leaky suitcase. But how can we change these things? Recently I had the chance to try, and it’s something I’ll never forget. 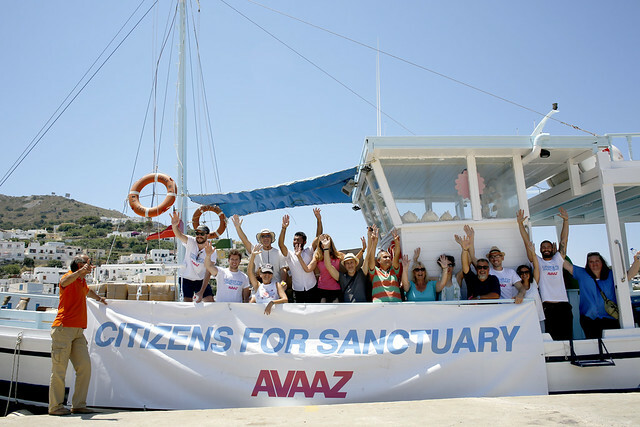 Thanks to donations from Avaaz members around the world, we bought a shipment of sleeping bags, health kits, and nappies (diapers) for refugees on two islands in Greece. With a handful of members from Athens, we took everything to Kos and then on to Leros island, giving refugees from Syria, Iraq, Sudan -- even as far away as Bangladesh -- a few things to keep them going. Something like 600 refugees arrive on the Greek islands every day and Greece is now the number one destination for refugees coming to Europe. We also delivered supplies to two local groups who have spontaneously responded to the refugee crisis around them. They’re the ones the police call when refugees need water or when a baby needs dry clothes. They’re teachers who work all morning and then offer hope and sanctuary in the afternoon. They’re people like Matina, a former High Court judge, who has politicians on the phone in one hand, while the other passes out nappies and a dry pair of shoes. They’re an amazing group of people, so full of energy, hope, and love, but also daunted by what’s coming -- and many of them also Avaaz members like you. But for me personally, the highlight of everything came on Kos island, late one afternoon. We’d handed out health kits at a broken-down ‘hotel’ where refugee families camp out. There were about 20 kids there, and for almost an hour we just played and joked around. Drawing Mickey Mouses, spinning in the dust, climbing on shoulders -- it was a chance to be fully human, laughing ‘til it hurts with kids who’d just left everything behind. The world is an angry place at the moment -- and governments are building walls, doing their best to shut people out. But as part of the Avaaz community we’re pushing back. In the face of everything, we’re wading into the water from a place of love and humanity. We’re taking down the poisonous narrative of “each one for themselves” and reaching over the walls. When governments respond with “No”, we go around them, short-circuiting their xenophobia and racism. Together we’re showing how the world can be a better place, where instead of shutting them out, we lift them up, look them in the eyes -- and we’re all happier for it. Thank you for making that possible. For seeing the news, reading our emails and getting involved. It would be so much easier to look away, but we’d be so much less human if we did. Thank you for putting your heart on the line and joining the fight. It’s going to be beautiful.